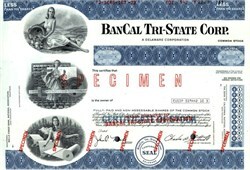 Beautifully engraved specimen certificate from the BanCal Tri-State Corporation This historic document was printed by the American Banknote Company and has an ornate border around it with a vignettes of 3 women. This item has the printed signatures of the Company's officers. 1972-05-01	BANCAL TRI-STATE CORPORATION located at 400 CALIFORNIA STREET, SAN FRANCISCO, CA was established as a Bank Holding Company. 1996-04-01	BANCAL TRI-STATE CORPORATION was renamed to UNIONBANCAL CORPORATION and moved to 350 CALIFORNIA STREET SAN FRANCISCO, CA. 2000-04-26	UNIONBANCAL CORPORATION moved to 400 CALIFORNIA STREET SAN FRANCISCO, CA. 2008-10-06	UNIONBANCAL CORPORATION changed from Bank Holding Company to Financial Holding Company - Domestic. 2014-07-01	UNIONBANCAL CORPORATION was renamed to MUFG AMERICAS HOLDINGS CORPORATION and moved to 1251 AVENUE OF THE AMERICAS NEW YORK, NY.